Hello friends! Read the compiled tweets of #ListenUp Wk17 by @BridgetElesin below. I tried to put in as many comments, questions and answers taken during the live tweetcast to give you the robust picture. Get Ready to learn, unlearn and relearn what you think you know about love and marriage! This post might seem lengthy but I tell you, it’s a MUST READ. We all have more at stake! Some of d factors dt can make married pple to leave instead of keeping to their vows & loving are Abandonment, Abuse; Affairs. #ListenUp. Some of d factors dt can make married pple to leave instead of keeping to their vows & loving are Abandonment, Abuse & Affairs. #ListenUp. Physical Abandonment is common wt women & they can carry on in their marriage like flat mates wt no sexual or physical touch #ListenUp. In d case of abuse,you have physical, verbal, emotional etc, most women/ men have suffered this in their homes at various stage #ListenUp. No form of abuse is good as damage done can traumatize the abused but I am totally against physical abuse @kemi_odutayo #ListenUp. We hv all sorts of affairs;emotional,physical etc. In emotional affair, d person bonds emotionally wt some1 dts not their spouse #ListenUp. I ask ds question & expect to know d reason why a guy has chosen d particular lady to b his wife& d girl agreed to his proposal #ListenUp. Your conviction is what will keep you going when those challenging times come in your marriage! Absolutely! #ListenUp You need to be sure God is in it cos that’s what will keep you going when the going get tough! The first question, I ask when I counsel soon to be / married people is? What is your conviction that this person is the one? #ListenUp. @kemi_odutayo , it will take wisdom, patience, long suffering and prayers to get the other person to be interested to make it work. @BridgetElesin What do u advice in a marriage where it seems only 1 if the parties is interested in making it work? Marriage can b likened to d unity of d teeth&tongue!D teeth bites on d tongue&d tongue,wl taste tins dt will put d teeth on edge #ListenUp. U need not blame yourself that you are d cause of ur spouse’s misbehavior. Every1’s reaction to things are personal decisions. #ListenUp. I blive any1 in physically abusive marriage shld get professional counseling;separate if need b as only pple alive stay married. #ListenUp. If u want 2 remain married, u must keep d circle of friends dt believe in marriage God’s way, pple dt blive in staying&Fixn tins#ListenUp. We also have marriage mentors we are accountable to,so when we have issues we can not easily resolve,we go sit&get wise counsel. #ListenUp. We kep a regular date night,get involved in doing things together&we keep friends dt believe in marriage. I am sure in almost 12yrs of marriage,we hv both entertained d thots of leaving but d truth is, it’s not greener on d oda side! #ListenUp. 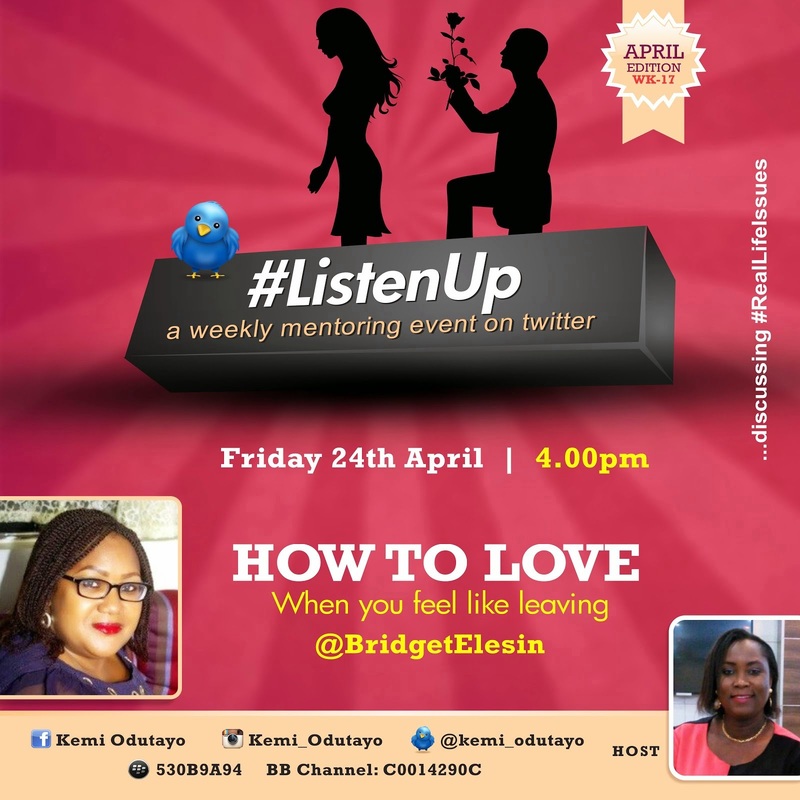 #ListenUp “Marriage no be beans o!” ~ @BridgetElesin So, let’s get ready and work at it! @BridgetElesin I am happy too o! The network was really on our side. Like l! Once again, i appreciate you! Today’s session on #ListenUp was simply a ‘wow’! @BridgetElesin left us with a lot of tweets(food) for thought! @kemi_odutayo to God be all the glory ma! I honor and appreciate you always. Wow! Profound words from @BridgetElesin. I believe God will use these words of hers to bring about a transformation in our lives and homes! Watch out for the MAY EDITION of #ListenUp. It promises to be a blockbuster! Stay blessed! ← YOU ARE MORE THAN THIS!